A Nuclear Stress Test is the same as a regular stress test except that the patient is injected with a small amount of radioactive substance such as cardiolite, which is harmless. This substance emits rays that can be seen by a special gamma camera. The camera produces pictures of the hearts tissues on a video monitor. The pictures show the contrast between light and dark spots, which can indicate damage or reduced blood flow. 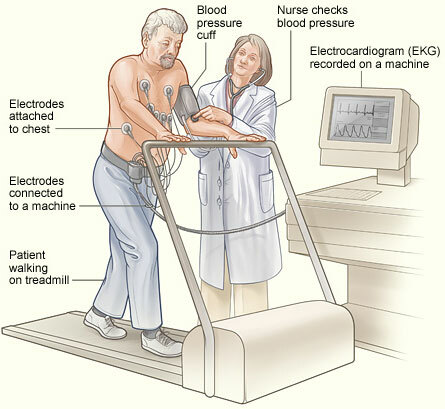 Both tests are used to diagnose symptoms of chest pain, lightheadedness, or shortness of breath. They can also check for the effectiveness of angioplasty (a procedure where the plaque in the arteries is pushed back), or other heart-related procedures, or predict the risks of dangerous heart-related conditions, like heart attacks.